My friend is an architect so whenever we visit a city, she’s always intrigued by the buildings, bridges, etc… and how all these architectural components are implemented in a city… or were just built somewhere without any environmental planning. When we were in Rotterdam last November, we visited the Cube Houses (see this post) and she was just over the moon with that visit, so when I planned our day out, I really wanted to do something concerning architecture. 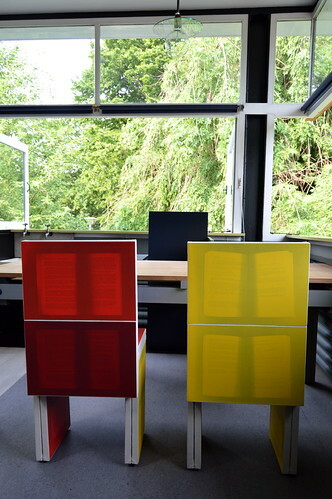 Browsing the site of Utrecht, I decided that a visit to the Rietveld Schröder House would be on the agenda that day as this house in the De Stijl art movement is really unique. 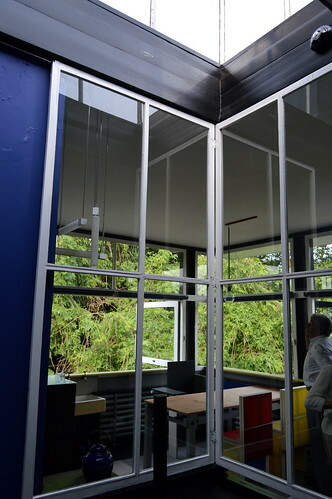 The Rietveld-Schröder House which we visited. 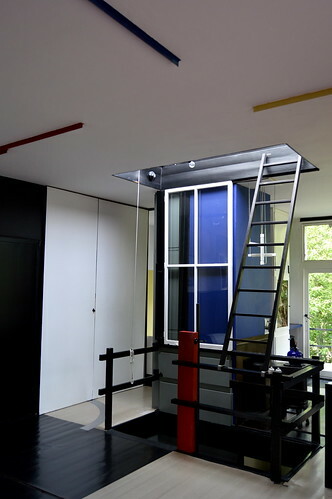 The Rietveld Schröder House is designed and decorated by Gerrit Rietveld. 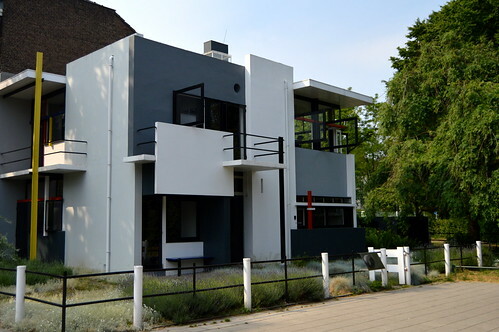 It was built in 1924 for widow Truus Schröder and her three children. She lived in it until her death in 1985, after which it was renovated. In 1976 the house became a listed monument and since 2000 it is a Unesco World Heritage Site. Now the house is a museum. 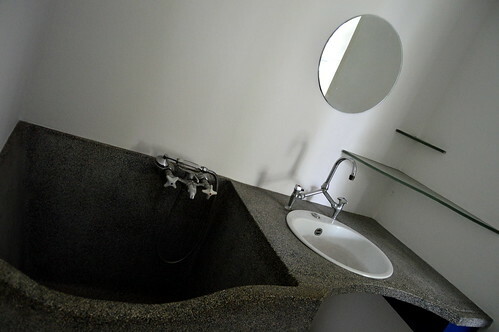 Mind, it is a small house, so visits are restricted to 12 persons per hour. You’d better check the website and order your ticket in advance not to be disappointed! 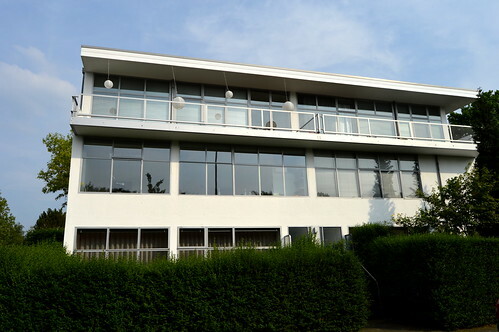 Mrs Schröder wanted a connection between the inside and the outside. That is why the house has so many windows. You can admire the views from all sides of the house. The views back in the 20ies and 30ies must ‘ve been quite different as it was built in an open space. When a plot of land was sold across the road, mrs Schröder decided to buy it. 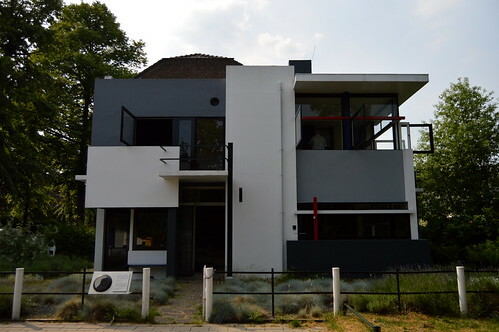 The plot of land was meant for housing and she let Rietveld design them. That way, mrs Schröder and Rietveld (who eventually lived with mrs Schröder in this house) could decide for themselves what their view would look like. The housing on the other side of the street. 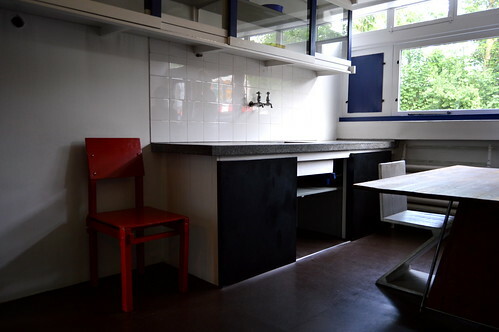 When entering the Rietveld-Schröder House, you are shown around the ground level, which has a kitchen area, a maid’s room, a sitting area and a workspace for Rietveld. In 1924 this minimalistic kitchen was very modern and different from what people were used to. At the table you see the zig-zag chair, created by Rietveld. Whereas downstairs, the division of the house is typical, the first floor is quite surprising. 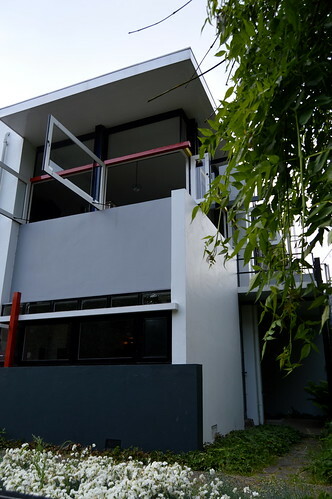 When you go up, the first floor is divided into several smaller rooms. But then the guide will start sliding the walls away, creating one large space. On the ceiling, you can see the railings on which the walls can slide from one way to another. 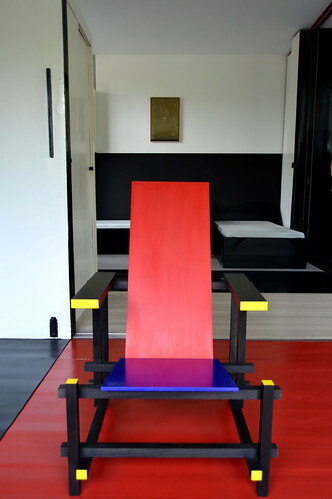 Gerrit Rietveld did not only design the house. He was also the decorator. Besides white, grey and black, he also used the primary colours red, blue and yellow which are so typical for this art movement. 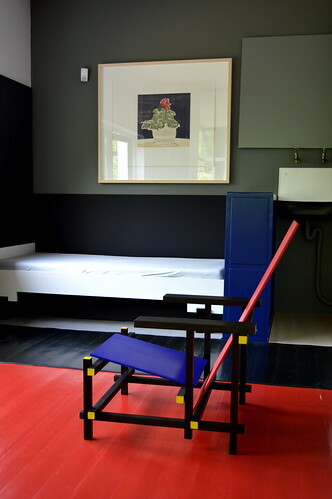 Inside the house you can also see lots of original furniture by Rietveld, for instance the well known zigzag chair (which you see on the picture of the kitchen) and the red/blue chair, seen on the picture below. 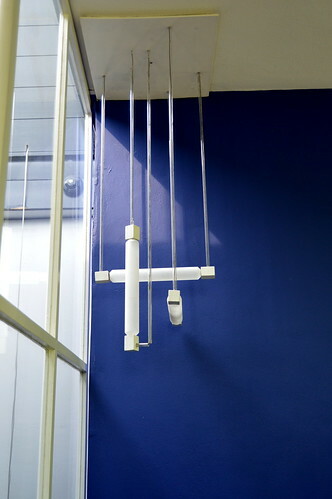 This lamp was also a design from Rietveld. I never expected to spend an entire hour in such a small house! I was really surprised by the many features and clever use of space. The guide also told lots of things about the building, the designer and the inhabitants which made the visit even more interesting. 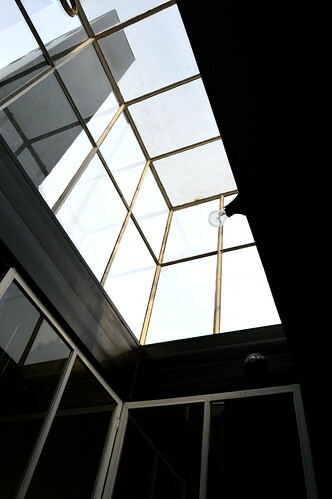 View towards the roof. There used to be a roof chamber. Although this house is not exactly situated in the centre of Utrecht, it is definitely worth visiting. We walked all the way from the city centre towards the house, which took us about 30 minutes. You could go by public transport I guess, but it was a lovely walk, crossing a beautiful park and many nice streets. 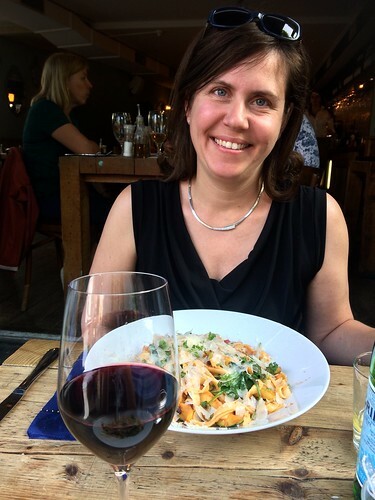 We had diner not far from the Rietveld Schröder House in a lovely Italian restaurant ‘Pastabar Oost‘. We shared an antipasti platter and had the pasta primavera as a main course. 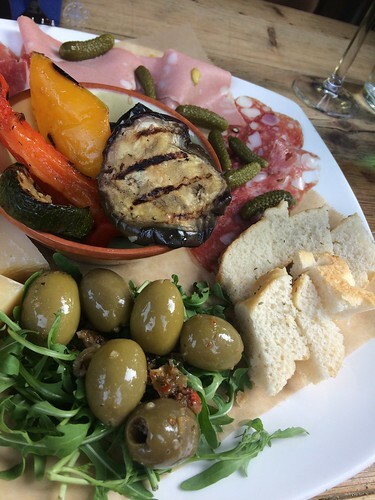 The service was very friendly, the food was good and we had a fantastic seat on the outdoor terrace… the perfect way to end our day! Here you can read another post about the lovely city Utrecht! I loved this sitting bath! This entry was posted in Holland, Travel, Uncategorized and tagged architecture, rietveld schröder, Travel, Utrecht. Wauw! Fantastisch! Leuke tip, die ga ik onthouden! O bedankt voor de tip!